Leading record label, Mavin Records does not relent in serving fans with pleasant surprises at every performance. 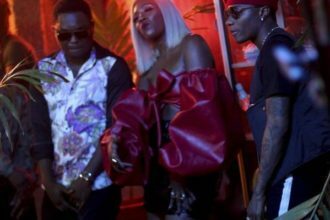 Performing at the Road To MAMAs concert which held at Federal Palace Hotel on Friday May, 30 Mavin all stars group Dr Sid, Aphrodija, Reekado Banks, Korede Bello joined Tiwa Savage on stage to perform their chart topping new single, ‘DoroBucci. Dressed in various colourful outfits they delivered a highly energetic performance to the delight of fans who missed who however missed the presence of Mavin Records Boss, Don Jazzy.